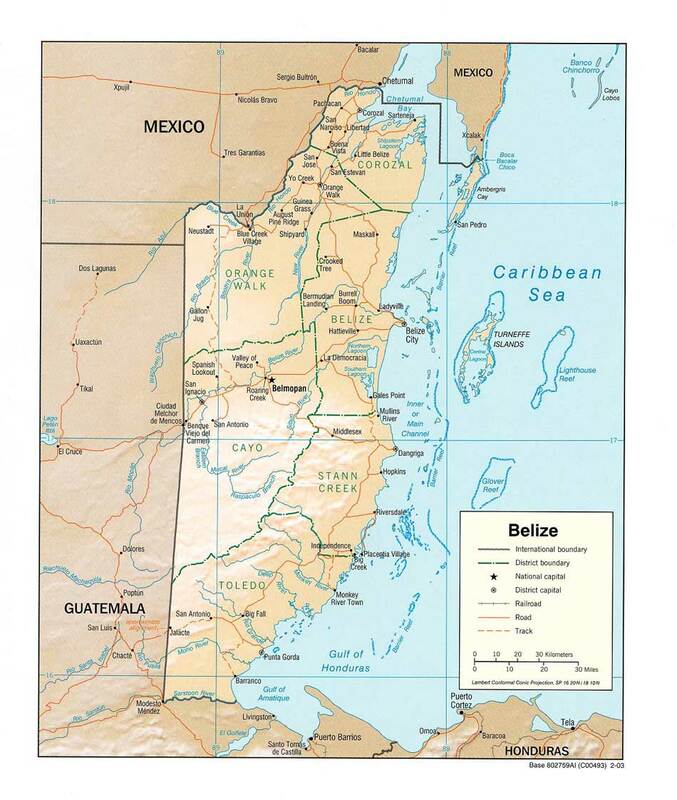 Belize (formely known as British Honduras) is a small country about 280km long and 110km wide. Lying on the Caribbean coast of Central America, it has Mexico to the North and Guatemala to the South and West. Belize is a relatively low-lying country with a coastline of small cayes and the second largest coral reef in the world. To the North the country is flat as it extends to join the Yucatan peninsula of Mexico. uplift, which has formed the Mayan Mountains where the main cave development is located. This mass of limestone along with the large rainfall, which occurs during the wet season, allows for a huge potential for cave development. Unlike the Yucatan peninsula, that has received attention in recent years, the landscape in Belize leaves potential for dry cave development. and the artefacts that maybe encountered within caves. To prevent theft or remains from being destroyed by ignorance, permission must be obtained from the IA. As of 2010 this needs to be initiated well in advance of any expedition planned for Belize. In addition it has now become a requirement for some form of archaeological expertise to be included within the expedition members. Permission to camp in the jungle and forest reserves must be obtained from the Forestry Department before heading into the jungle areas. There is often a charged levied for this permission. Culvert Road, Belmopan, Belize C.A. The geology of Belize means it has been well known as a caving destination. American and Canadian cavers have been active in the country since the ‘50’s and there have been several UK expeditions, including two by Queen Mary College in ’88 and ’89 and one by Mendip Caving Group in ’94. However, the bulk of caving exploration has been done in the Northern and Central parts of the country with the South (Toledo District) being sporadically explored and largely undocumented. It was for this reason in 2001 that we decided to base ourselves in this part of the country. • 2001 - 3 cavers explored and surveyed several caves, between San Jose and San Pedro Columbia. • 2002 - 5 cavers returned to area but only had limited success due to effects of Hurricane Iris, which had devastated the area shortly after the 2001 trip. • 2004 - 2 SWCC members joined 3 other cavers based at the British Army (BATSUB) barracks, exploring several caves across the country. • 2006 - 7 cavers re-explored and surveyed Champon Cave, initial exploration of Pueblo Creek Cave; explored to a log jam with continuing passage beyond. Lagonita Cave discovered. First attempt to get to Central River sink at Esperanza Camp, an area of large karst features. • 2008 - 10 Cavers, Pueblo Creek explored to over 3km with ongoing leads. In Tiger Cave the ‘Roaring River’ is passed and explored for 500m with leads ongoing. Esperanza camp reached and various new leads identified. • 2010 - 9 Cavers, Pueblo Creek pushed to within 400m of Ochochpec cave. 2nd entrance to Tiger Cave discovered and parallel streamway explored. This site is © Copyright www.swccbelizecaving.co.uk 2018, All rights reserved.